In part 1, I explained how I came across Caverns of Mordia. Here is the Q&A I had with Hans Coster, the developer. Note that this was done before he came to Wozfest and before the re-release. Q: It’s great you’ve still got the source code – has that been transferred onto a more recent storage medium? A: No, it hasn’t. I should transfer it from the floppy disk because that media has a finite retention time. There are still service bureaus that will transfer such material. Q: Which prompts the question, was all the coding done on an Apple or did you have access to other ways of doing it, perhaps on a uni mainframe or mini? A: I did it all on an Apple II. Q: Is it all written in BASIC or is there some machine code used? A: Most of it is written in Applesoft (BASIC) and compiled using the Microsoft Applesoft compiler. There is some machine code in there as well, mainly for sound effects etc. Q: I only have an original disk. Was there a box and manual? How was the product packaged? 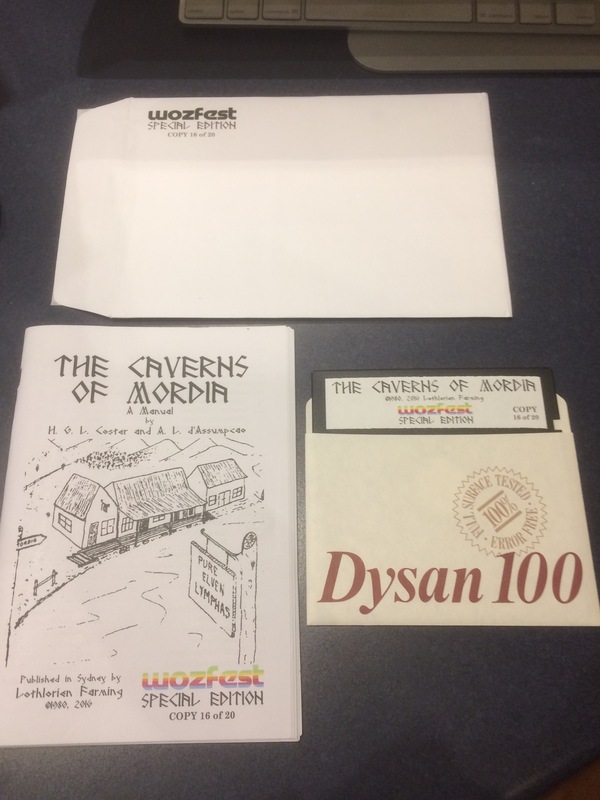 A: Yes a special box/package was made and it contained the disk and manual and command entry table. Q: Do you have any original copies left? A: Yes I have some original copies of the manual etc. Q: The scanned manual I’ve found online mentions A L D’Assumpcao – how did that collaboration work? A: Tony D’Assumpcao was a Professional Officer in the School of Biochemistry at UNSW at the time. He was a very keen Dungeons and Dragons player (which I was not!). He talked me into writing Caverns of Mordia. He also did most of the drawings in the manual/story book. Q: How did you distribute it? Was it ever distributed outside Australia? A: By direct sales using ads in computer magazines and by word of mouth. Some orders did come from overseas but we did not actively market it outside of Australia. Did you produce any other software? What else did LF do and how long was it in business? A: Yes, following the Caverns of Mordia, I wrote a number of Tutorial programs for School students. These were rote learning exercises and included The Geography Tutor, The Spelling Tutor, The French Tutor, The German Tutor and The Universal Tutor. These all came with prepackaged lesson files but also included a facility to enter new lesson files. The program tracked the student performance and adjusted the probability of question selected from the list to favour the student weak areas. They did also provided feedback on nearly correct answers. In addition library catalogue and archiving programs were produced. These were all marketed under the Lothlorien Farming logo. Later, I wrote a much more complicated software system for Library management. That was marketed by Lothlorien Software. It was called the Integrated Microcomputer Library System. It was very comprehensive and performed all the functions then available on Mainframe library management systems, including a financial package for library acquisitions. It provided for multiple PC terminals in a network with very rapid searching. It was more comprehensive than the Mainframe library system at Fisher library at Sydney University at that time, except that because of limitations on Hard drives available for PCs, we were limited to libraries with <100,000 books. The Integrated Microcomputer library system initially ran on both Apple IIe’s and other PCs, but later versions only ran on PCs as they offered more memory etc etc. It was installed in many Schools throughout Australia and some sites abroad. A: Yes indeed! Many of the characters and items in the game are named after those in The Lord of the Rings. Q: The manual has a copyright date of 1980. How long did it take to write? A: A few months. The original version was written for my children and friend, many of whom were into Dungeons and Dragons. It evolved and was distributed (and copied) amongst them. Only later, Tony D’Assumpcao suggested to market it and helped write the manual. Q: Roughly how many copies did you sell? A: Marketing was haphazard so I cannot recall but it was in the thousands. Q: Roughly what proportion were DOS 3.2 and DOS 3.3? Q: This post mentions a copy protection system. Can you tell me about that? A: Yes there was a copy protection system that I devised. This became necessary because the game proved popular and pirate copies started to appear. For the copy protection I amended the DOS. The altered DOS program would not show the game software in the Directory list if a user listed the Directory. Instead a loading program appeared that itself was not the usual loading program but contained hooks to allow the game to be loaded. In a pre-booted machine running the normal DOS, the program appeared not to be there either as the File allocation had been performed using the altered DOS and was different from what the normal DOS used. Thus it could not be loaded (or copied) from normal DOS. If the supplied diskette was booted up, the altered DOS was loaded and it could find the program although it still did not show up in the Directory and file saving was disabled. In the game, the players status is recorded and that required the file saving to be temporarily dynamically re-implemented. .
Q: There’s a downloadable dsk version of Mordia online that seems to crash a lot – would this be due to the copy protection system? Or possibly the emulators not working properly? A: I was unaware that there is a downloadable dsk version on-line. I would be interested in getting details. The crashing could well be due to the copy protection because that is called within the program here and there. I have been meaning to remove the protection and re-do the whole thing to run on a PC. Q: Someone on the whirlpool forums mentions an IBM version – was there an IBM version or is that person thinking of something else? A: I am not aware of an IBM version. Q: Do you still have an Apple II? Q: I’ve attached an image showing the back label of the disk. Any comments? A: The making of the recording on the diskette was somewhat laborious because it had to be initialized with the altered DOS. But that DOS had the file saving code removed and a scrambled Directory function. Because there was room for error in this many-step process, each disk was individually tested. The signature is that of my daughter who was 11 at that time and who was involved in making the disks as orders came in! Did you ever send out any news or updates to club members? A: Yes indeed. There were some very active groups playing the game. Sometimes the game nights would go right through the night! A: Not that I can think of at the moment, but I would be pleased to discuss it further. Q: Thanks for taking the time to answer! A: It is my pleasure!